Amazing Unbound Cross-Modulating LFOs with logarithmic curves and exotic wave-followers. Video! How to load system Exclusive patch banks (like the ones from this site) in the SQ8L! Click Here! it just shows how much I know. It would be enough for the VST to be a tone-perfect recreation of the SQ80, which it is. As it stands, the SQ80 is one of the most faithful “classic synth reproductions” in the industry, and that’s saying something. In a world where major industry players can funnel tens of thousands of dollars into R&D and still come up with clones that resemble, but don’t duplicate the original, the SQ8L nails it! Compare this to reviews of the formidable MiniMoog, Prophet and Roland VST clones out there. Even casual reviewers will comment on the fact that the software clones bear a striking similarity to their hardware predecessors, but fail when it comes to perfect emulation. The story of how Siegfried Kullmann came to model the SQ80 so closely is really the tale of two DOCs. Doctor Rainer Buchty, who extensively re-engineered the original hardware, and the Ensoniq DOC chip. Rainer’s work made him come to realize the importance of the famous Ensoniq DOC chip to the sonic character of the synth. 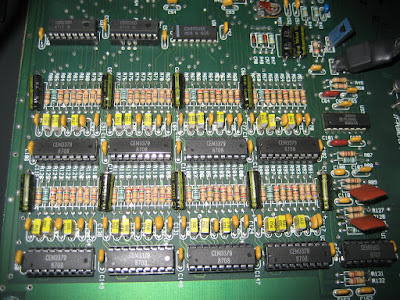 This is the same chip that is the heart of the groundbreaking Ensoniq Mirage and the infamous Apple II GS. In fact, the Ensoniq music component caused the second round of lawsuits between the Beatles Apple Corps. music empire and Apple Computer. The resulting lattice of agreements between the two companies began a series of events that would culminate in Apple’s near-dominance of the music industry in the early 21st century with the iPod and iTunes! You could almost say that this musical empire all began with a little 8 bit chip designed by Ensoniq uber-genius and co-founder Robert "Bob" Yannes (who also created the famous Commodore 64 SID chip!). While other soft synths like the Wusikstation essentially duplicate the Ensoniq signal flow, only Siegfried Kullmann has developed a sound based on the specifications of the original Ensoniq sound engine. It could be argued that the DOC chip has as much or more influence on the sound than the famous Curtis filter bank that graces the synth. Without this key innovation, the SQ8L would be just another retro VST. But the SQ8L is more than just a clone. One look at the capabilities of the LFO section, for example, and any die-hard synthesist will be in module nirvana! But don’t take my word for it. Download the free VST and fire it up in your host. The sound will blow you away. Or double your money back! Download the VST from Buchtynet! in conjunction with the Curtis 3379 filters that give the synth its distinctive sound, not the waverom. In fact, we have done some experiments with other waveform sources, and the ESQ/SQ80 retains its character even with totally “alien” oscillation sources! Similarly, other hybrids like the Prophet VS and PGP have been cloned as VSTs. Talk to the people that know those synthesizers best, and they will tell you that those clones are similar, but ultimately don’t do justice to their hardware predecessors. But the SQ8L is almost universally acclaimed. Even power users like synth veteran Don Slepian praise the SQ8L as a remarkable achievement in emulation. --Better yet, they use it as part of their everyday workflow! These waveforms have even been included in a number of previous VSTs. I don’t recall anyone ever calling Crystal or WusikStation “identical to an ESQ”. The truth is, it just took a lot of hard work, experimentation and clever design to devise the SQ8L software synth. My hat is off to software developer Sigfried Kulman. Sigi, I don’t know how you do it. We all wish you well in your further ventures. If you ever decide to release the commercial version for modern systems, I know a number of musicians that will line up with cash in hand.